Do you use Writer's Workshop in your classroom? We do not have a schoolwide writing plan. Each teacher does whatever they want. We have a writing program but no one cares if we use it. 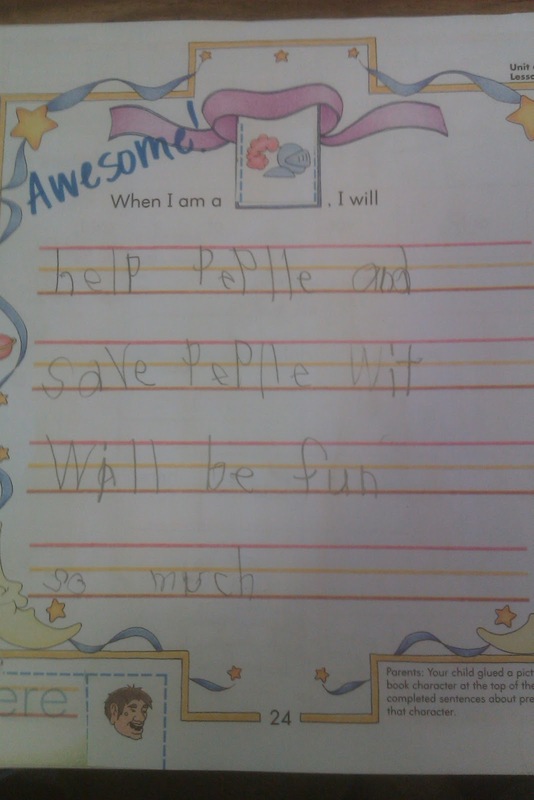 Last year I used the program we have, but it was very dry and no one enjoyed writing. Over the summer, I took a class for my ESL endorsement called Reading in a New Language, and for my final project, I had to research something I wanted to improve about my literacy instruction, so I chose writing and did research on Writer's Workshop. Then I decided to do it this year! I don't have anyone mentoring me, no one in my school has ever done Writer's Workshop, so I am on my own but doing my best. I use the lessons from Portland Public Schools. Thanks, Portland!! Anyway, that whole backstory was to tell you that writing is really different this year for us. I think we are doing really well (compared to last year at this time) and everyone seems to really enjoy it! I still have some boys who are spending all of their writing time drawing pictures........ but for the most part, we are good. In our first grade reading curriculum, they occasionally have writing activities for us. Maybe once every 2 units or something. 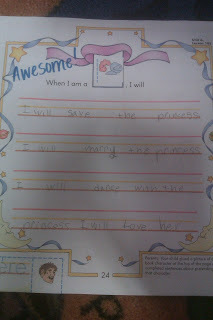 This past unit, the first graders had a prompt: "When I am a princess/knight/giant, I would..." (They got to pick which character.) I was so happy to see what they came up with on their own! Aw! And this was one of my little ladies who took an unconventional route and did NOT choose to be the princess! Maybe she is trying to send a message to the boys in our class.......... haha! 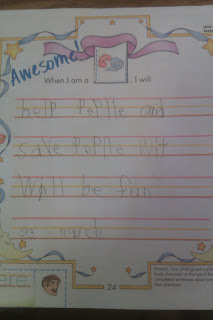 I'm really impressed that he spelled "save" correctly, because we haven't learned silent E yet - that starts tomorrow!